Catalysts are often made of expensive precious metals, which work most efficiently when very small particles of the metal are fixed to a less expensive carrier, such as magnetite (iron oxide). But the smaller the particles are, the more they have a tendency to move and join to form larger particles. 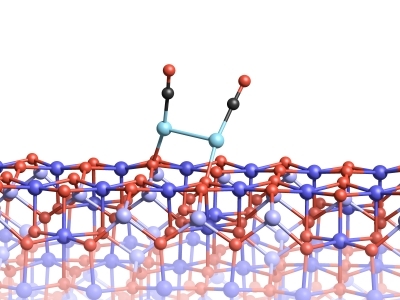 Scientists at TU Wien (Vienna, Austria) and Utrecht University have identified how carbon monoxide plays a role in the mobility of these particles, but also the stability of clusters of several platinum atoms on a magnetite surface. From Utrecht University, PhD-candidate Jessi van der Hoeven playes a major role in the publication. The researchers announced their findings in a publication in Proceedings of the National Academy of Sciences on 25 July. The platinum atoms are held in place by oxygen atoms in the magnetite, but on some other surfaces they tend to form larger particles of the metal. However, binding to a molecule of carbon monoxide can cause the platinum atoms to separate from the surface, an effect known as the ‘skyhook effect’. Together with the carbon monoxide molecule, the platinum atom can then move over the surface of the magnetite. This causes platinum atoms to come together to form clusters that are so stable in the presence of carbon monoxide that they cannot grow into larger units. The study showed how the behaviour of individual metal atoms and clusters of atoms can be influenced by the molecules present, which is essential in order to understand the stability and life cycle of catalysts. Two platinum atoms on the magnetite surface can bond, if they are attached to CO molecules. The full article “Dual role of CO in the stability of subnano Pt clusters at the Fe3O4(001) surface”.